Taylor announces bout with her old rival! At a press launch on Monday 25th February at the Royal Theatre, the Bray woman announced that she will face her old rival Denista Eliseeva at the Royal Theatre, Castlebar on March 24th. Katie now sets her focus on the next two steps on the Road to Rio and her ultimate goal of becoming a two time Olympic Champion. Eliseeva remains the last boxer to have secured a victory over Taylor. The two met in Eliseeva's native Bulgaria back in February of 2011 in a multi nations tournament with Eliseeva awarded a controversial points win. Taylor and her Dad Pete were left baffled by the decision after what appeared to have been a clear cut win for the Irish woman. Taylor has since avenged the defeat and can now look forward to a meeting with Eliseeva on home soil when they clash at the Royal Theatre, Castlebar next month. However Taylor's Dad Pete insists it won't be a revenge mission. 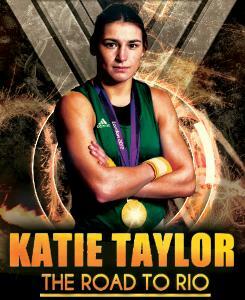 "I hadn't even told Katie about the opponents for March because she was just concentrating on last weekend. Whenever people say that she is the last girl to beat Katie I always correct them and say she was the last to get a decision over her because nobody outside of the judges thought that Katie lost that fight. Katie has avenged every defeat she's ever had and she beat Eliseeva in the European Union championships later that same year but we're looking forward to boxing her again in Ireland." Following her win in Dublin overnight Katie was in Castlebar on Monday 25th to meet fans and confirm details of next month bouts at the Royal Theatre. The 26-year-old says she's excited at the prospect of another fight night at the Bord Gáis Energy Theatre before heading west on the same weekend. "The reception I got last night was amazing and I'm so grateful for everyone who came out to support me. It felt like the Excel Arena in London all over again and it definitely spurs you on. The crowd can really lift you and you want to put on the best performance you can for them." Taylor hopes that the series of fights will inspire a whole new generation to follow in her footsteps and after last nights win over Klueners she stayed back to sign autographs and have countless pictures taken with fans. "I'd love to think I'm a good role model for kids," said Taylor. "At the moment there are a lot of bad role models out there and they are often the ones getting on the front of the papers or magazines so it's important to be a good role model for all these young kids and to set a good example for them so it's something I take very seriously. "Any sport is a great for kids, it's a healthy lifestyle and they learn so much aboutthemselves, its character building and a great way of life for any child.